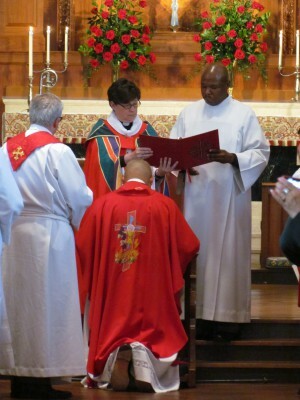 I’m still caught up in the euphoria of last Saturday (September 13, 2014) when I was installed as Bishop of the Northeastern Ohio Synod. Even though a week has gone by as I write this, the flood of memories still bring a tingle, a smile and a warm feeling that borders on feverish. St. Paul’s Episcopal Church, Akron. The sanctuary at St. Paul’s Episcopal Church in Akron was filled to capacity. Besides family, there were people present from all stages of my life, childhood friends, college friends, family friends, students from my teaching days, co-workers from my years in broadcasting, from my time in the Cleveland Indians front office, colleagues in ministry, and former parishioners from both congregations I served. They came from all regions of the country; places near and far – Arizona, Connecticut, Illinois, Indiana, Florida, Michigan, New York, Pennsylvania, South Carolina, and Virginia. The diversity, demographic, ethnic, racial, and denominational was wide-ranging. 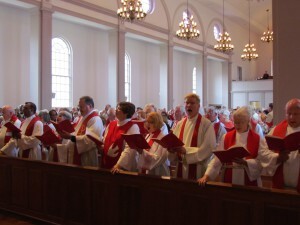 And then there was the sea of clergy, all dressed in their white albs and red stoles. I was especially grateful for the presence of several ecumenical partners, who spoke and pledged their cooperation as we strive for that unity that Jesus prayed for us. It resembled the scene from Revelation quoted above. 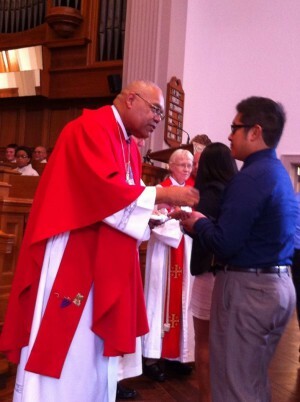 It also very much resembled a scene from my ordination 11-1/2 years ago. Back then I cried uncontrollably. This time, although it called for a great deal of effort on my part, I was somewhat able to control my emotions. But it was a challenge. As I processed into the sanctuary, I saw a couple of people and felt tears welling up in my eyes. It was then that I decided not to look either to the right or to the left, so as to avoid eye contact with anyone whose presence would make me begin to cry. These are scenes most people never experience in their lifetime. They mostly occur at a person’s funeral. I have been blessed to have witnessed this type of honor twice. I thank God for all these blessings. I thank those of you who were there. I am also grateful for all the congratulatory wishes, the cards, the gifts, the emails, the phone calls. 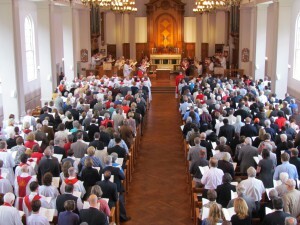 I ask God to help me be faithful in my office; to commit myself to this new trust and responsibility; to carry out this ministry in accordance with the Holy Scriptures and the confessions of the Lutheran Church; care for the pastors and congregations of this synod; to love, serve, and pray for God’s people, nourish them with the word and sacraments, and lead them by my own example in faithful service and holy living. All these and the other promises I made I confide that God will graciously give me the strength and compassion to perform them. It is so good to hear from you!!! I think of you often and am glad to know that “retirement” is agreeing with you. Hopefully, when my travels take me to the eastern part of the state, I will make time to see you.